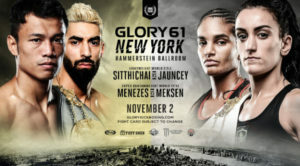 Hammerstein Ballroom in the Empire State host Glory Kickboxing as the hold Glory 61 New York, featuring a championship double header as the Glory Men’s Lightweight titles & Women’s Super Bantamweight are both on the line. 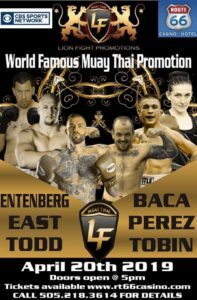 The main event has Canada’s Josh Jauncey, who’s won consecutive decisions over Stoyan Koprivienski & Christian Baya, challenging Thailand’s Sitthichai “Killer Kid” Sitsongpeenong for the Glory Lightweight title he’s defend 5 times; for a 8 fight win streak. The co-main event is the third time we’ll see Jady Menezes vs. Anissa Meksen in the Glory ring. Meksem defeated Menezes at by unanimous decision at Glory 43 New York, in the Super Bantamweight title tournament. This past August Menezes dethroned Meksen of the championship with a split decision win at Glory 56 Denver.